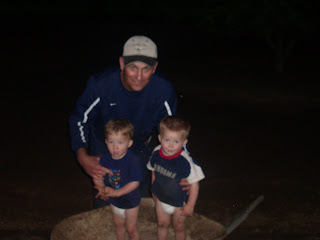 Here is Caleb & Connor with "Pa"...They loved to wrestle around on the floor or ride him like a donkey. I miss him soooo MuCH! He was the Best Dad in the World. Never mad angry or grouchy. Always smiling, happy and saying how beautiful I was. Every day, didn't matter what I was wearing or how my hair looked he'd always say, You are a pretty Girl ~ or you sure are Beautiful! He would always want to be where his family, kids & grandkids were. Playing with them around the house and would always say, "Man, look @ us...Aren't we Blessed?" And make you look and agree with him. He is so So Awesome! And will always Be my HERO!